The first days in the Himalayan kingdom of Nepal will leave you with many impressions: magnificent royal palaces, Hindu temples, shrines adorned with rich woodcarvings, Buddhist Stupas, with their white cupolas and the all-seeing eyes of Buddha as well as colorful markets and busy bazaars. After this cultural potpourri, you will fly to Tibet. The first days of sightseeing will acquaint you with the people and their culture and allow time for your acclimatization. Near Tsetang (3400m), you will visit a castle from the first kings of Tibet and have a good view across the fertile Yarlung valley. On the way to Lhasa, we will visit the oldest monastery of Tibet, Samye. We have two days sightseeing in Lhasa (3600m), the spiritual and secular center of Tibet. You will see the beautiful and historical palaces as well as monastery like Potala palace, Sera Monastery and Norbulinka Monastery. 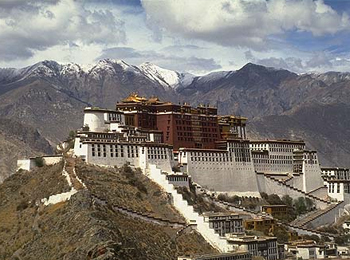 Potala Palace is percehed upon the Ri Marpo (Red Hill) 130meters above Lhasa valley. Potala Palace itself rises 170 meters further making it the highest monumental in Tibet. Marpo Ri has legends that its rocky hill is scared cave was dwelling place of Bodhisattva Chenresi (Avalokitesvara), later used as Meditation cave of Emperor Songtsen Gampo. In 637 AD Songtsen Gompo built a palace on this hill and this structure stood untill 17th century. The construction of present palace was built in the reign of The 5th Dalai Lama in 1645. Potrang Karpo and Potrang Marpo were complete on 1648. Sera was founded in 1419, by Jamchen Chojey (Sakya Yeshe), a disciple of Tsong Khapa.Like the Drepung and Ganden monasteries, it had several colleges: Sera Mey Drat sang, built in 1419, gave basic instruction to the monks. Sera Jey Dratsang, built in 1435, was the largest, and was reserved for wandering monks, especially Mongol monks. Ngagpa Dratsang, built in 1559, was a school for the teaching of the Gelukpa tantras. Sera housed more than 5,000 monks in 1959. Although badly damaged following the invasion of Tibet and the Cultural Revolution, it is still standing and has been largely repaired. In 2008, it housed 550 Buddhist monks, but the number dropped to only a handful after the 2008 Tibetan unrest. After the Chinese invasion of Tibet and the destruction of the majority of the monasteries in Tibet, Sera monastery was re-formed in Bylakuppe, India; near Mysore.Because none of the monks of the Ngagpa Dratsang (Tantric College) survived the invasion, only the Sera Mey College and Sera Jey College were re-formed in India. The Norbulingka Park was begun by the 7th Dalai Lama beginning in 1755.The Norbulingka Park and Summer Palace were completed in 1783 under Jampel Gyatso, the Eight Dalai Lama, on the outskirts of Lhasa and became the summer residence during the reign of the Eighth Dalai Lama. The stables of the Dalai Lamas in Norbulingka, photographed in 1986. The earliest building is the Kelsang Potang Palace built by the Seventh Dalai Lama , which is "a beautiful example of Yellow Hat architecture. Its fully restored throne room is also of interest." The 'New Palace' was begun in 1954 by the present Dalai Lama and completed in 1956. It contains chapels, gardens, fountains and pools. The gardens are a favourite picnic spot and provide a beautiful venue for theatre, dancing and festivals, particularly the Sho Dun or 'Yoghurt Festival', at the beginning of August, with families camping in the grounds for days surrounded by colorful makeshift windbreaks of rugs and scarves and enjoying the height of summer weather. The palace is located three kilometers west of the Potala Palace , which was the winter palace. Additional buildings were added to the park during the first half of the 20th century. There is also a zoo at Norbulingka, originally to keep the animals which were given to the Dalai Lamas. Overnight in Lhasa. You will perch high above the city, the holiest temple Tibet’s, the Jokhang, and the Gelugpa monastery of Drepung. Across the vast Tibetan plateau we drive back to Nepal and get a good glimpse of the Himalayas and the Trans Himalaya. The drive leads across passes of more than (5000m) with dazzling views of the snow-covered peaks and fluttering prayer flags, we pass the turquoise-colored Lake Yamdrok and Tibetan houses with their flat roofs. In Shigatse and Gyantse visit such important monasteries as Tashilunpo and the Kumbum, rich in sculptures and murals. The last leg of the trip along the Arniko Highway brings us to Dhulikhel, known for it good views on the central Himalayas. Accommodation: 4 nights in hotels in Kathmandu on bed and breakfast and 11 night Lodge or camping treks in with breakfast, lunch and dinner. Day 14 : In Kathmandu, free day to rest and shopping.